For the Love of Love Album reviews. I found this song to be a social commentary on how women try their best to impress men, but also how they want their independence and power (the ability to throw him back). This song made me think of my one-liner, "If they say there are more fish in the sea, then how come no one is taking my bait?" According to these lyrics, I didn't have the right "bait." I was going for personality, when duh! everyone knows that guys go for physical appearances first. (Note: that IS sarcasm). To me, in this song, the woman has the ability to be feminine and to be mature about it. My favorite line of the song sums it all up for me: "I'm as old as you think I am and as young as you need me to be." In listening to the rest of the album, her songs continue to contain the powerful electric guitar, as in "Disconnected," "On My Mind," and "Just the Gardener." Other songs that feature her acoustic guitar and keyboard abilities are "My Gun," "The Girl with the Prozac Smile," and "Ecstasy." Next to "Man-Bait," my other favorite song on this album is "The River." Not only do I dig this song for the cool banjo incorporated with her electric guitar, but this song also has a couple lyrical meanings. The first meaning that I took from it is: a person who's been "dragged down" by the river, as if the river is a metaphor for something in the person's life. This seemed to make sense for my friend, who was being dragged down by her (ex?)boyfriend. However, as I was listening to this song on the drive from work, hearing key words as specific as "grace," "voice," and "Mississippi," I realized that this song could be an ode or swansong to the late, also amazing guitarist/singer Jeff Buckley. For those of you whoe aren't familiar with his works, he is a guitarist who has released a few albums, one of which is entitled "Grace." His life abruptly ended because of an accidental drowning in the Mississsippi River. It makes sense to me that Klein would write this song since he was such a talented guitarist. 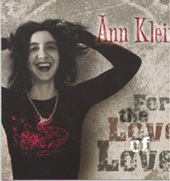 So, whether you're relaxing in your home or driving your car, the latest effort from Ann Klein is sure to please!